This was my first year attending the National Education Association’s Student Leadership Conference and it was held in Boston, Massachusetts. I had the privilege of attending this conference along with 14 other preservice members from our state as well as aspiring educators from all over the country. Since this was my very first time attending this conference, I thought I would share some of the highlights of my trip as well as some tips that I learned along the way. I received a scholarship for this event from NJEA which means that I was lucky enough to be reimbursed for my traveling expenses. We were given a budget and most of us chose to fly because parking in Boston can be expensive. I carpooled to LaGuardia Airport with two other preservice members because we thought that the times and the prices of the flights were perfect for when we needed to arrive, especially because we didn’t want to have to wake up ridiculously early. This is my biggest tip: don’t choose an airport in New York to fly to Massachusetts from. Don’t do it. One person drove to my house and we left at 6 AM to pick up another person. I figured it would take about an hour to get to LaGuardia from my house so we would probably get there around 7:30-8:30 am, park, do our luggage and security, and grab breakfast while we waited for our 10 AM flight. That did not happen. We encountered so much traffic that we arrived at the airport at about 9 AM and then still had to take a shuttle from the parking lot. It was a mess. -Can’t We Just Get Along? All of them were very informative but I think that my favorite session that I attended was “Can’t We Just Get Along?” because the session focused on both generational and cultural differences. I’m from Colombia but I’ll be teaching here in the United States so it’s always beneficial when I have the opportunity to learn about these issues and figure out the best way to close both the cultural and generational gaps that I may face as a new full-time teacher. During my time in Boston, the NEA also had us participate in something called The Legacy Project. The Legacy Project this year took place in Everett, Massachusetts and we teamed up with retired members of NEA to put it all together. Kids from all ages came out and were taken by student buddies to impact stations that were run by students. I was an impact leader and my station was all about traffic safety. We played “Road Safety Bingo” and the kids won prizes and got stickers for participating. I think the most challenging aspects of this particular event were the planning because we worked with students from other states and then it was challenging to differentiate the game to make it fair for a mix of ages playing at once. Overall it was a success, though and I had so much fun doing it! It was one of the most rewarding experiences that I had on this trip. Planning Legacy was a bit of a challenge because we worked with students from other states but getting to meet so many people from all over the country was incredible. This brings me to another tip: be prepared to talk and work with people from all over the country! We were constantly communicating with other states through this app that we used called GroupMe and it made it so easy to have questions answered. Sometimes we also used it to identify what states we were from so that we could trade pins because almost everyone who attended SLC was given pins by their state to bring and trade with people from other states. The pin trading was absolutely hilarious because I took it so seriously! I was on a mission to get as many pins as I could and that included a pin from Maine because they sent only one student this year. His name was Stephen and I had the pleasure of receiving his last pin which was awesome. Next year I’m going to try to get all of the pins. Miyuki Manzanedo, of California, won our “Sweets of Diversity” basket and she was just as sweet as the candies she won! While pin trading and Legacy were major parts of SLC, one of the most important things that we did was fundraise for the Political Action Committee. Our union dues are untouched by PAC so that we can choose how much we want to contribute to the politics. The NEA and NJEA use the money to support candidates that support public education. They are not affiliated with any specific political party; we just support the best candidates for education. This year NEA SP had a night of fundraising by auctioning off baskets donated by the attending states, having a dance party, and playing trivia. 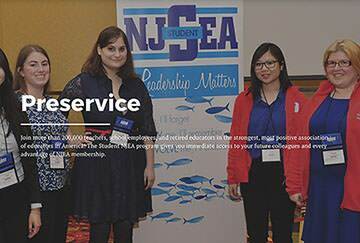 NJEA Preservice donated two baskets this year and we raised $1,240 for NJEA’s PAC! Overall, the NEA SLC is a great opportunity to meet people from all over the country and make a difference in both your state and a state that you visit. I found it to be great fun and I’m looking forward to attending next year as an SLC veteran! Have you attended NEA-SP SLC? What was your experience with it? Do you keep in touch with anyone that you met from other states?